Potential modifications to the activated sludge process have been assessed, in order to improve simultaneous removal of a diverse range of micropollutants. It has been proposed that wastewater treatment facilities meet legislated discharge limits for a range of micropollutants. However, the heterogeneity of these micropollutants in wastewaters makes removal difficult to predict, since their chemistry is so diverse. In this Open Access study by researchers at the Cranfield Water Science Institute in the UK, a range of organic and inorganic micropollutants known to be preferentially removed via different mechanisms were selected to challenge the activated sludge process (ASP), and determine its potential to achieve simultaneous micropollutant removal. At a fixed hydraulic retention time (HRT) of 8 h, the influence of an increase in solids retention time (SRT) on removal was evaluated. The maximum achievable micropollutant removal was recorded for all chemicals (estrogens, nonylphenolics, and metals) at the highest SRT studied (27 days). Also, HRT optimisation by extension to 24 h further augmented organic biodegradation. 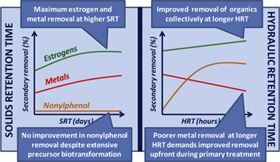 Most notable was the enhanced removal of the considerably recalcitrant synthetic estrogen 17α-ethinylestradiol, which increased to 65±19%. Regression analysis indicates that this enhanced micropollutant behaviour is ostensibly related to the concomitant reduction in the food:microorganism ratio. Interestingly, extended HRT also initiated nonylphenol biodegradation, which has not been consistently observed previously in real wastewaters. However, extending HRT increased the solubilisation of particulate bound metals, increasing effluent aqueous metals concentrations (i.e. 0.45 μm filtered) by >100%. This is significant, as only the aqueous metal phase is to be considered for environmental compliance. Consequently, identification of an optimum process condition for generic micropollutant removal is expected to favour a more integrated approach, where upstream process unit optimisation (i.e. primary sedimentation) is demanded to reduce loading of the particle bound metal phase onto the ASP. This enables longer HRT in the ASP to be considered for optimum removal of organic micropollutants. Water Research, Volume 62, 1 October 2014, Pages 180–192. The use of ultra-filtration membranes has enabled the separation of multi-resistant germs.